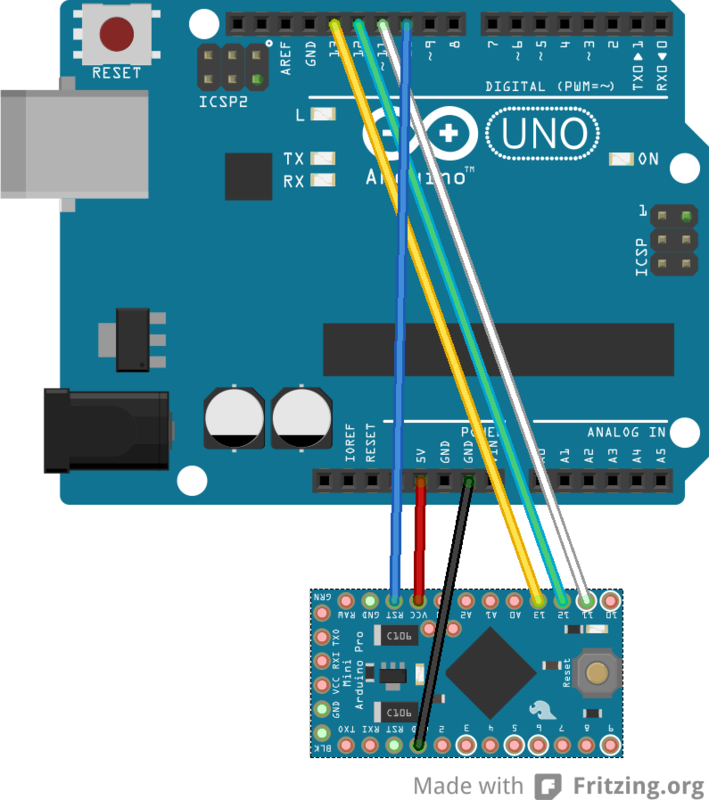 Why not an Arduino in each project ? In my opinion, Arduino are really cool, but they are a prototyping component, just like the breadboard. When the prototyping stage is over, things have to move on a more permanent and specialized board, and that frees the Arduino for the next prototype. – it is a nice way to learn about electronics. 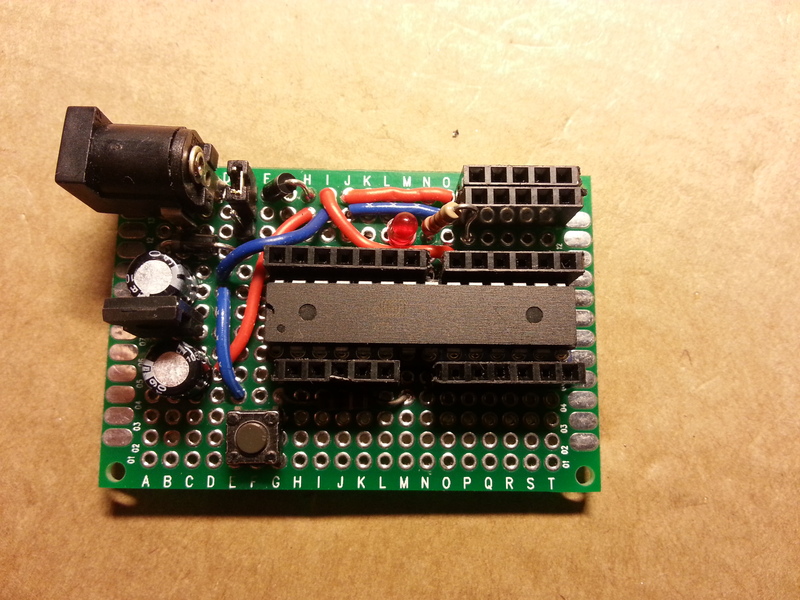 This article covers in details ATmega328P-PU (on his own oscillator to save components) and Arduino Pro Mini 3.3v 8MHz programming, but one can reproduce the method with every Atmel SPI chip or Arduino board without a USB. 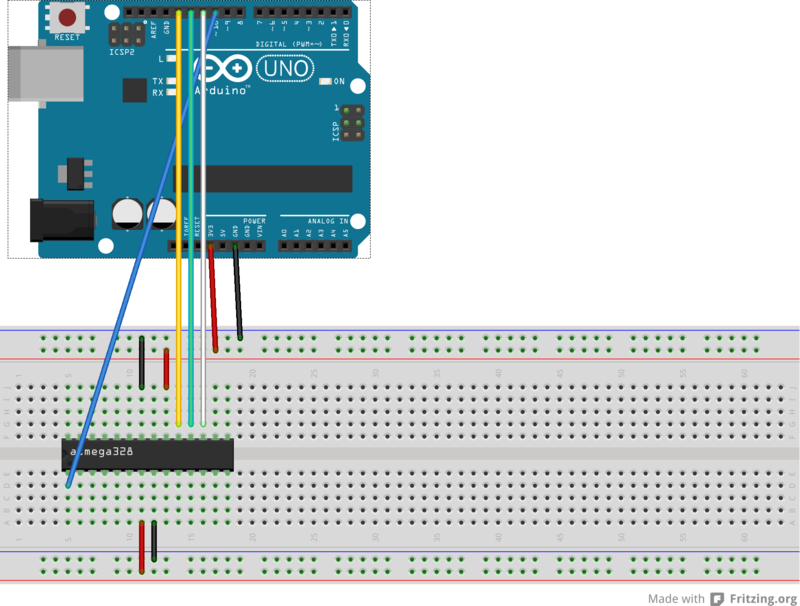 – a special arduino sketch to make the Arduino act like a programmer. The bootloader is a kind of BIOS for microcontroller. It handles the low-level settings of the chip. Each chip has his own bootloader version, so an ATmega328-PU bootloader is not compatible with an ATmega328P-PU one (notice the added « P » for Pico-Power. So, when you want to program a chip, first make sure you downloaded its bootloader if needed, and set it up the way you want it. This time, the bootloaders we are using are already part of the Arduino IDE. We just have to add a new board to the list, for the ATmega328 3.3v 8MHz. Other chips could require a few extra steps, we’ll cover this part in a future article. The Arduino sketch Our Arduino Uno needs a special sketch to be able to act as a programmer. Unfortunatly, the ArduinoISP sketch provided with the Arduino IDE doesn’t seem to work, so there is a another, better one available : mega-isp Download this sketch, unzip it in you sketchbook directory and restart your IDE. Now, you could upload this sketch into your Arduino the normal way. You are now ready with the software part. You should choose the right voltage for your chip, (3-5V for ATmega328P-PU or 3-12V for the Arduino Pro Mini 3.3v). The ground has to be common. In the ArduinoISP code, one can notice some extra components could be added for debuging purposes, but they are not needed. Your hardware setup is ready, go to the last part. Now your software and you hardware are ready, plug the programmer Arduino in the computer and start the IDE. You should see your Arduino appear in the COM ports like normal. If it is not the case, unplug it, exit every IDE windows, plug it back, and restart the IDE. In the programmer menu, you should now choose Arduino as ISP. Now, you can upload your sketch in you chip the normal way, using the ‘Upload with a programmer‘ option in the File menu. If you try to use the regular ‘Upload‘ button, you would obtain a ‘not in sync: resp=0x00’ error message.